Uporaba: postopoma dodajajte 35-145 g peletov za 100 L vode, nekaj novih pelet dodate starim po cca. 3-6 mesecih. 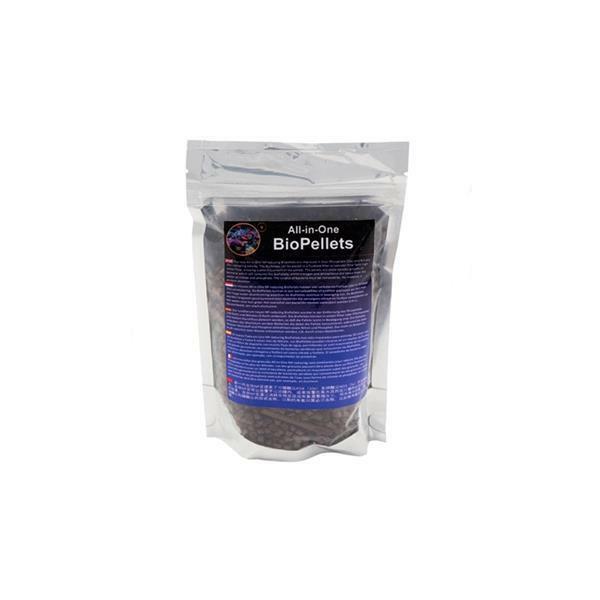 All-In-One Biopellets (Patent Pending), which can be used to more efficiently remove both Nitrogen (5x) as well as Phosphates (10x-20x) without the need of using separate phosphate removing substrates. The pellets will allow aerobic growth of bacteria which consequently will consume nitrate and phosphate simultaneously. The bacteria will use up the carbon from the All-In-One Biopellets, whilst nitrogen and phosphorus are taken from the water as nitrate and (ortho)phosphate. This conversion of organic BioPellets (together with inorganic nitrogen and phosphorus) into microbial biomass is called immobilization. In contrast to our “old” Biopellets, we have observed that the All-In-One Biopellets work best with very high water flow. For example, a 700 liter tank with a fluidized filter containing 2 liter of All-In-One Biopellets already requires a minimal flow through of 2000-3000 l/h. On Note, this particular tank contains approximately 50 fish and after 10 months of testing both nitrates and phosphates were undetectable with standard nitrate and phosphate kits. Kompaktna ščetka za cevi premera 25/34 mm.